MAKE YOUR NEXT VOLUNTEER TRIP COUNT BY JOINING ONE OF OUR PROGRAMS AND BECOME PART OF A WORTHWHILE CAUSE IN ECUADOR TODAY! Located at the center of our planet, Ecuador is the perfect country to volunteer in. This country is relatively small in size, which means there are many opportunities to explore different regions of the country, different climates and the best part of all get to meet some of the most welcoming people this country has to offer. Ecuador has beautiful, tranquil Pacific beaches, which give way to spectacular sunsets and skies. Also in this country there are incredible hikes to go on which lead you to peaceful lakes resting near the peaks of active volcanoes. These volcanoes separate the ocean from the Amazon, the notorious life filled jungle with a high variety of plant and animal species. Another pristine gem that this country has to offer are the Galapagos Islands. These islands are what inspired early explorers like Darwin to study and discover different species of animals and wildlife. Most people would agree that the Galapagos Islands are the crown jewels when it comes to animal and marine conservation. Even though Ecuador is relatively small, it is rich in culture. The indigenous people of this country are very proud and have conserved many of their ancient traditions including their unique dresses. Agriculture is still very important and farming is quite common. If you have an adventurous palate, you will be pleased to realize that the local food is delicious, especially dishes served with Platano, which is a green banana. Even with all this rich culture, many people in Ecuador still need basic services. So just as the country logo says 'Ama la Vida', come to Ecuador, love life, create memories and make a difference. One of the most concerning issues Ecuador is facing is deforestation. From the 1900’s to the mid 2000’s, Ecuador had lost over 30% of the mangroves, which is a type of tree. According to the current deforestation rates in the area, coastal forests will be gone within 15 years and the Amazon forests will be eliminated within 40 years. Traditional farmers are taken most blame for this. Oil development has also affected deforestation. A program has established for reforestation. Only 10,000 acres of forest land was renewed. The impact it has on the country is increased land erosion and damaged valuable soil. Also, a loss of habitat leaves many animals with no home or cover. When animals lose their home that are in the forest, many can only make homes in the forest so they could die off. This is proven because 70% of land animals live in forests. Also, trees are animals number one form of protection to anything that could harm them. The Amazon rain forest holds one of the most diverse number of animals and with that being washed out, animals could go extinct. Our volunteer programs provide incredible opportunities to create meaningful experiences while making valuable contributions to the deprived and needy people of the local community. As a volunteer, you get to live and work with the poor and disadvantaged people of another country provides the type of classroom that no other study abroad experience can replicate. Volunteers experience a unique way of appreciating the world while helping developing communities to help themselves. Simultaneously the volunteers help to empower the host communities in creating renewable and sustainable programs. Volunteering will give you a whole new perspective of the world, to support a cause, share your knowledge, meet new people and develop new skills. Our programs encourage and promote excellence in humanitarian and conservation volunteering. By becoming a volunteer, you will become integrated into the Ecuadorian community which will most likely enrich your soul and your spirit. WEATHER AND CLIMATE: The climate varies by region, due to differences in altitude and proximity to the equator. The coastal lowlands to the west of Ecuador are typically warmer with temperatures in the region of 25 °C / 77 °F. From January to April, temperatures are hot and often rainy. The weather in the capital city of Quito is consistent to that of a subtropical highland climate. The city has a fairly constant cool climate due to its elevation. The average temperature during the day is 18.9 °C / 66 °F, which generally falls to an average of 10 °C / 50 °F at night. The average temperature annually is 17.8 °C / 64 °F. There are only two seasons. The dry season (summer) runs from June - September and the wet season (winter) runs from October - May. However, the climate you will experience can vary and often depends largely on where you are in Ecuador, since there are four distinct geographical areas—la Sierra (Andes Mountains), el Oriente (Amazon Jungle), la Costa (the Pacific coastal lowlands), and the majestic Galapagos Islands of the coast. My name is Chantelle, I'm 26 years old and from Toronto, ON Canada. In my mind, Volunteering is the best way to explore the world and learn about its different cultures. It teaches you to look at the world through different eyes, opening them to new wonders. My first experience volunteering was with Volunteers Without Borders in India. As a volunteer there, I taught English in a rural community. The level of poverty shocked me but I was amazed to see just how happy the children were. Kids will be kids and it was beautiful contributing to their fun. They did not need Ipads or gadgets, only just their imagination. Volunteers Without Borders opened my eyes to the experience of volunteering abroad and after my experience in India, I realized just how powerful it was and wanted to continue volunteering in other countries. The next program I volunteered on was in Ecuador where part of my duties were installing toilets, I had no idea what to expect. It turned out to be hard physical work but it was well worth it as the rewards were plentiful. I was the only female volunteer at the time so the women and children of the village would shower me with gratitude. I would practice my Spanish by speaking and playing with them. They would give me the Rice and fruits as a gesture of their appreciation. I went home exhausted, but so happy to have influenced their lives in such a positive way. I was able to visit so many different regions of Ecuador and meeting its diverse people. What a great program and experience. I would highly recommend this program to everyone and anyone looking to make a difference. THANK YOU! Our volunteer programs in Ecuador provide great opportunities to make real and valuable contribution to the deprived and needy people and its communities. We're proud to offer unique and enriching volunteer experiences that are driven first and foremost by the needs of the local communities. To live and work with the poor and disadvantaged people of another country provides the type of classroom that no other study abroad experience can replicate. Volunteers will get to experience a unique way of appreciating the world while helping developing communities to help themselves. 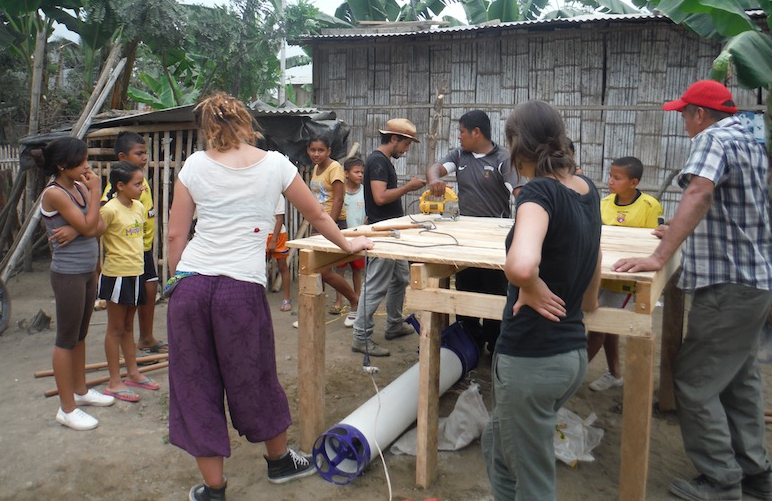 Volunteers help to empower the host communities in creating renewable and sustainable programs. Our programs provide volunteers with great and meaningful opportunities to help others and by doing so, it provides the volunteer with a whole new perspective of the world, to support a cause, share their knowledge, meet new people, and develop new skills. If you are an individual, couple, family or group; you will be provided with the opportunity to live and work side by side with the community and local people on locally designed and driven projects. The aim of this program is to encourage and promote excellence in humanitarian and conservation volunteering. Our programs offer you the opportunity to become integrated into the Ecuadorian community and enrich your spirit. Our programs are designed to facilitate hands-on service and cultural exchange in the aim of fostering cultural understanding. They are also designed to meet the challenges of contributing much needed skills to the struggle for self-sufficiency in the development of our country. PLEASE NOTE: These programs run all year-round and begin every Monday. Volunteers choose their own start dates and are encouraged to arrive 1 or 2 days early. Location: Quito, Ambato, Latacunga, Otavalo, Ibarra, Puerto Lopez, Cuenca and Galapagos. One of the major social problems Ecuador has is irresponsible parenting. Many children are born to families that lack the minimum conditions to provide for their well-being. For this reason, many children have to go to the streets to sell, beg, and somehow make extra money for the family income. In other cases, children are mistreated so much that they run away from their homes or are abandoned by their parents and in order to survive, children have to work in the streets. The purpose of this program is to help the children that are forced to live in the dangerous streets every day and that have no conscious of their rights as children. Working at an orphanage is probably one of the toughest and most rewarding things that you can do when it comes to volunteer work. Our programs offer you the opportunity to make a valuable contribution to the lives of some of Ecuadorian's most underprivileged and vulnerable children, giving them the attention and time that they deserve. There are many children in Ecuador who don't have anybody to call their own. These children have been abandoned by their parents or those who come from homes of domestic violence and are sheltered by the orphanages. Our orphanage locations are spread out throughout the country and each orphanage is home to 25 or more abandoned or unwanted children. The age of the Children range from less than 1 year up to 14 years old. As a volunteer on this program, you will be involved in the day-to-day running of an orphanage and will be assisting the kids to learn life skills that parents would normally teach. With your contribution, these children will be given a sense of pride, self-confidence and dignity; qualities that are often lacking due to the problems associated with their past. 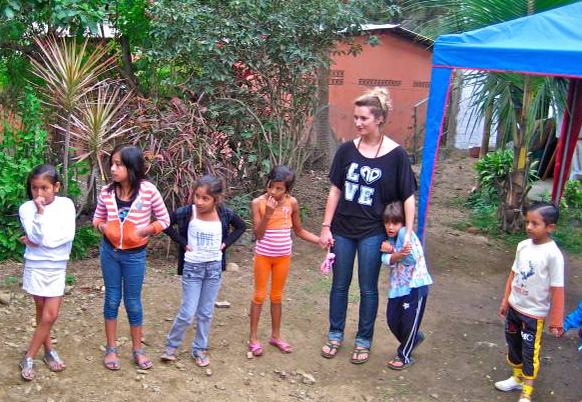 The children of Ecuador and their families need the support of volunteers as many are living in extreme poverty. By working with the children and their families the aim of the program is to alleviate poverty and give these children a fighting chance to make a better future for themselves. Many Ecuadorian families live in substandard, overcrowded, poorly constructed homes that are barely maintaining their structural integrity, resulting in very unsafe and unsanitary living conditions. With your help, more deserving families can have decent places to call home. Our objectives are to help Ecuadorian families benefit from the availability of existent housing programs. This volunteer program is ideal for volunteers interested in construction and building, modernizing homes, or simply helping people and their families to live in safer and comfortable conditions. If you are looking for a rewarding experience to provide decent housing for a family in need, people from all over the world are welcome to join us to build simple, decent and affordable houses, working in partnership with the community, local authorities, etc. As a volunteer on the construction program, you will work as part of a volunteer team and alongside villagers which will allow you to learn about traditional methods of building and working. Our infrastructure and construction volunteering also offer you the opportunity of being involved in the construction of houses, school buildings, parks, libraries, community buildings, bridges and so on. Helping to build, rebuild or renovate homes, school or bridges in rural and poorest areas of Ecuador is an immensely rewarding program to get involved in. As a volunteer on this program, you can expect to get involved in the following ways: digging, mixing sand and cement, carrying rocks, sand and bricks, repairing fences, roofs or cabins, assist and support in the construction of water pipes, toilet building, houses, painting, renovating, gardening, digging, removing dirt, cleaning carrying bricks, blocks or bamboo, mixing cement, plastering, plastering, etc. If you are a qualified doctor, nurse, or a medical nursing student, then your skills are needed and welcome in Ecuador. Our healthcare volunteering program is designed to provide medical care for those in desire need. As a volunteer on this program, you will be serving and making a real contribution to the health care system in Ecuador by assisting at a variety of different medical institutions such as governmental and municipal health centers along with community medical organizations. You will get a unique opportunity to work in both urban and rural areas throughout Ecuador. For pre-medical students and medical students, volunteering in our medical and healthcare program is an excellent way to gain experience combined with the opportunity to help people. Whatever your motivation may be (lending a hand or learning and gaining experience); you are always welcome. We look for sensitive, enthusiastic, friendly and open minded volunteers . A background in medicine or nursery is preferred but is not mandatory. As a volunteer on this program, you may be required to assist in various procedures depending on ones individual education and experience. Volunteers may be able to help out during various medical procedures or assist local doctors and nurses in their daily duties. This program allows volunteers to work in rotations (depending on numbers of weeks of participation) in different medical departments such as: general medicine, pediatrics, gynecology, dentistry, surgery, nursing, physiotherapy, emergency, ophthalmology, nutrition and clinical laboratory among others. Being able to interact with the local people, understanding medical terminology, as well as knowledge of the Spanish language are all highly recommended for this program. PLEASE NOTE: This program runs year round and begins every Monday. There is a minimum requirement of a 2 week program and a maximum of 24 weeks. This programs accepts volunteers of all sized and ages. The most ideal time to join this program is during the summer months which is between the months of May until December. The winter season in Ecuador is between the months of December to May. The main initiative of this program is to put into practice ecological alternatives for the agriculture production in order to preserve the environment and ecosystem as well as to provide with healthy food to the local communities across Ecuador. As a volunteer on this program, you will get an opportunity to participate in general activities related to agriculture such as sowing seeds, pricking, planting, weeding, pruning, creation and maintenance of gardens, composting, harvesting, recycling organic waste, simple constructions, and feeding and caring for animals among others. 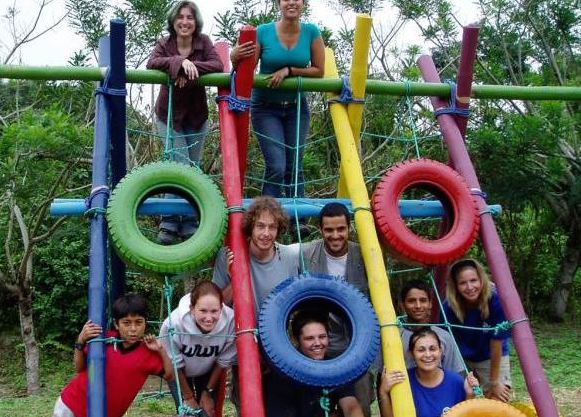 We offer meaningful and exciting group volunteer programs for high schools, colleges and university students, families, friends, youth groups, members of a club and employees from a particular company, or any other type of group who would like to spend time together at a volunteer activity in Ecuador. If the purpose of your trip is experiential education, service learning, community service, cultural exposure, language advancement or just a unique group experience, then this is the perfect destination for you. Our group volunteer programs combine meaningful community service with exciting adventure and/or cultural activities. We work with community groups, community and environmental NGOs, educational centers, corporations and others to design a trip tailored to your group's specific vision. We take care of the logistics so you can focus on the experience. This is a rewarding experience as our group volunteer programs are custom tailored to meet both the group's interests (humanitarian and educational fulfillment) and the needs of the projects. In this way we ensure that all parties involved will gain a positive overall experience. Our group volunteer programs offer complete flexibility and you can choose when to go and how long to go for. They are designed to be safe, affordable and offer a great experience to the volunteers. A ‘Gap year’ is a period of time when students take a break from formal education to do something that provides learning and personal growth opportunities through travel, volunteer, internship, language study or work. A gap year is typically a twelve month break from study taken by some students between high school graduation and starting college, during college, or between college and starting graduate school or career in order to gain a meaningful experience and valuable life skills. We organize unique gap year volunteer programs combined with fantastic adventure excursions, cultural activities and home stay for high school, college and university students across Ecuador in South America. Besides, our gap year program gives you the opportunity to study and learn the Spanish language or improve your Spanish skills. We work with individuals and groups of all ages to tailor a combination of programs that match interests, needs and goals. Our gap year program can last for several weeks, a semester, or up to 1 year. You are welcome to volunteer in Ecuador and get involved during your gap year in an inspiring range of community service and environmental programs. This special project provides a great opportunity to put your time into a meaningful and rewarding volunteer program. As a volunteer, you could be working in a childcare center, healthcare center, animal care center, national park, elementary or secondary school, veterinary center, etc. This is a perfect way for you to spend your energy, enthusiasm and good will and put it in a program that is designed to help improve the lives of those less fortunate. Program Fee – airport pickup (available from Mariscal Sucre International only), orientation, program supervision, accommodation (private or dormitory style) and meals during volunteer program period, in-country 24/7 volunteer support and in country administration costs.